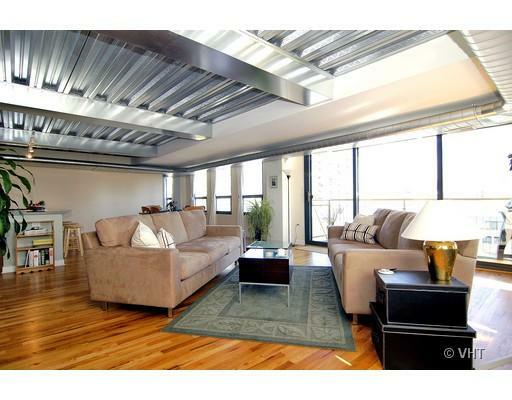 This loft at 1910 S. Indiana( the Engravers Lofts) gets my Way Cool rating. Most of what I see on a day to day basis is so much the same that I can’t usually keep them straight. However, this loft is really neat with some very unique finishes that make it stand out from all the other drivel out there. The unit is priced at $399,900 plus an additional $30,000 for the parking space and the monthly assessments are $484. 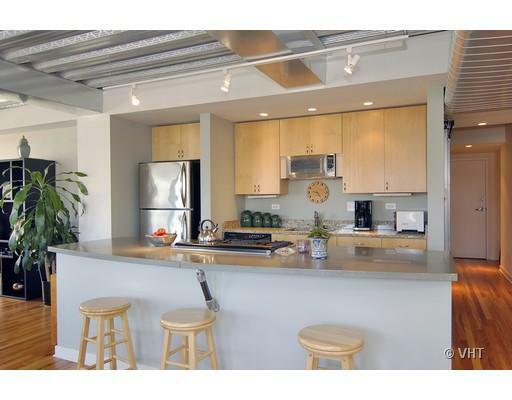 It is a 1659 square foot northeast corner unit with 2 bedrooms, 2 baths, and a fabulous view. You get to see a nice mix of high rises, green space, and smaller buildings. In this photo of the living room you can see that the unit has expansive floor to ceiling windows and a steel ceiling – you don’t see too many of those. The kitchen island has a polished concrete counter top with a swerve design embedded, supported by a metal pipe – one of the many interesting architectural details in this unit. 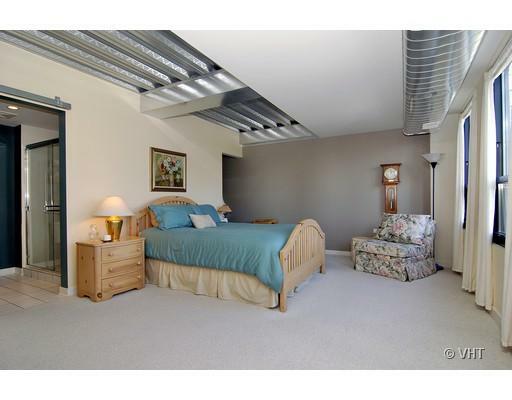 The master bedroom has a partially dry-walled ceiling to break up the monotony and you can also see two other unique design elements. All the HVAC ducts are flattened as opposed to the standard circular shapes seen in almost every other loft. And on the left side of the picture you can barely tell that the bathroom door hangs from a metal bar above the doorway and rollers allow it to glide across. I can’t remember if there are multiple types of doors in the unit but I do remember that the front hallway closet door is made of a heavy metal screen. 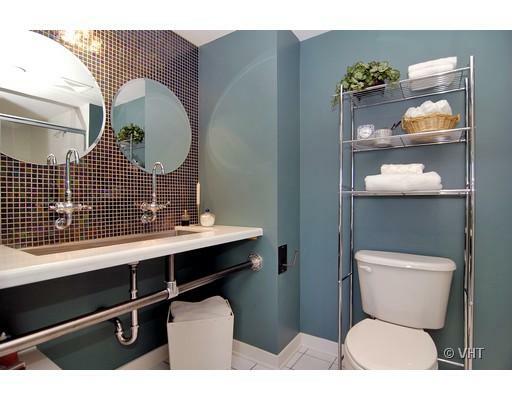 Check out the interplay of several unique design elements in this master bathroom: mosaic tile wall, circular mirrors, high neck faucets, single wide basin sink, and a vanity supported by a metal pipe. There are two things people might not like about this unit: 1) The balconies are bright yellow and 2) the ceilings are unfashionably low – not the 17 feet that seems to be irrationally popular. In particular, the clearance can be a bit tight when standing under the duct work. Nevertheless, I think this place is way cool! 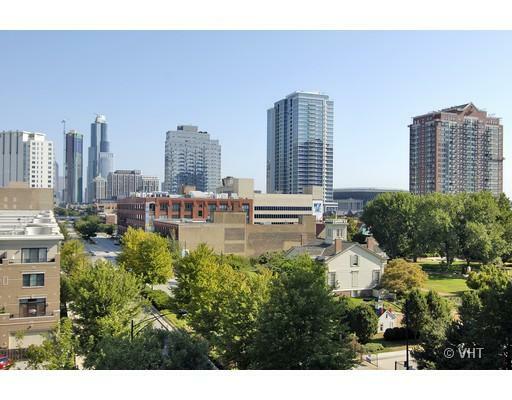 The unit is listed by Keller Williams and has been on the market for 90 days now.